Nicholas: Coffee Supreme- South Blend. 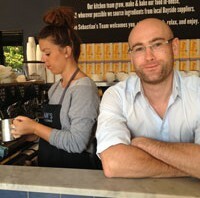 Nicholas: If I wasn’t a barista, I’d be unemployed of course! Nicholas: Black, no sugar. I use a clever coffee dripper at home to brew. Nicholas: I would say the people I work with. I’m really fortunate to work with such a great bunch of people. They’re all really lovely, with a great sense of humour. Nicholas: For work, definitely Gotan Project. They produce modern Parisian style, funky music. It transports me back to my trip to France and I can re-live sitting in the cafes of Paris. Such a great city for their professional hospitality industry. Nicholas: I do love French food. It’s extremely rich and the dishes are put together really well. Nicholas: My best coffee experience was going to Mountain Top coffee plantation, just outside of Nimbin. I was lucky enough to be invited for a private tour. Australia grows great coffee but unfortunately due to the high cost of labour in Australia, compared to other parts of the world, it makes the coffee very expensive to produce and therefore most of the coffee is exported to Japan and China etc. Nicholas: Tea, lots of tea. What can I say? I’m English. Nicholas: My personal opinion, you can’t beat strawberries coated in dark chocolate together with a long black coffee. Try it- you’ll be amazed. Nicholas: Definitely. Black coffee drinkers love the taste of pure coffee. Skinny latte drinkers are watching their weight and strong latte drinkers are normally either tired or hung-over. Nicholas: Are you calling me ‘old’? Nicholas: Ethiopia. To take part in a traditional coffee ceremony. Only the women are allowed to prepare the beans. They roast them and then grind them in a pestle and mortar, then serve the coffee starting with the oldest person in the room. It’s quite primitive, but it’s a very old and theatrical ceremony that I’d love to take part in. Nicholas: I’d make George Clooney a real espresso coffee, so he can stop drinking those terrible “pod” coffees he advertises and is so fond of. This entry was posted in Barista of the week, Brewsflash, news2013 and tagged Hampton, Nicholas Maslin, Sebastian's Food and Wine. Bookmark the permalink.